On June 11, 2008, On August 24, 2006, the International Astronomical Union (IAU) voted at the meeting of its Executive Committee to establish bright "dwarf planets beyond the orbit of Neptune as a new class of substellar objects in the Solar System called "plutoids" (IAU press release). According to the IAU, these plutoids "are celestial bodies in orbit around the Sun at a distance greater than that of Neptune that have sufficient mass for their self-gravity to overcome rigid body forces so that they assume a hydrostatic equilibrium (near-spherical) shape, and that have not cleared the neighbourhood around their orbit. Satellites of plutoids are not plutoids themselves, even if they are massive enough that their shape is dictated by self-gravity. The two known and named plutoids are Pluto and Eris [formerly 2003 UB313]." In addition, "it was decided that, for naming purposes, any Solar System body having (a) a semimajor axis greater than that of Neptune, and (b) an absolute magnitude brighter than H = +1 (magnitude will, for the purpose of naming, be considered to be a plutoid," so that many large and relatively round Edgeworth-Kuiper ice bodies may eventually be designated as plutoids, including 2004 XR190. On August 24, 2006, the IAU voted to establish a new category of Solar System objects called "dwarf planets." 2003 XR190 is probably large enough to have a spherical shape and so is a candidate for IAU designation as a dwarf planet. On December 13, 2005, a team of astronomers (led by Lynne Allen) announced the discovery of a new planetary body between one-fifth to one half the size of Pluto, found during routine operation of the Canada-France Ecliptic Plane Survey (CFEPS) as part of the Legacy Survey on the Canada France Hawaii Telescope (CFEPS press release). The object's brightness indicates that it is likely to be between 500 and 1,000 kilometers (300 to 600 miles) in diameter. 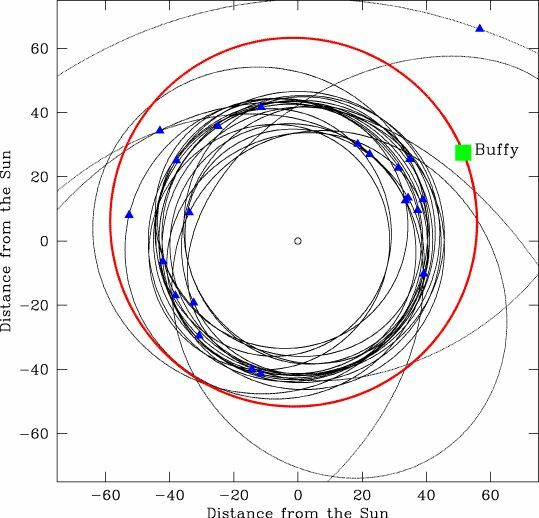 Currently designated 2004 XR190 (or XR 190) but nicknamed "Buffy," the object takes about 440 years to move around the Sun at an average distance (semi-major axis) of 57.4 AUs in a relatively circular orbit (e=0.11) that is inclined about 46.7� to the ecliptic. It is the first known object with a relatively circular but highly tilted orbit beyond Neptune and Pluto. This orbit is hard to explain using existing models of Edgeworth-Kuiper Belt formation (more technical details). 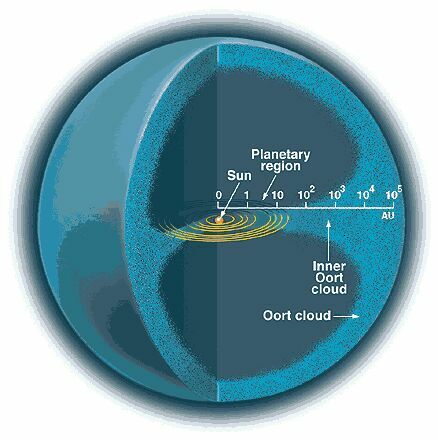 In late 2005, 2004 XR190's highly circular orbit was considered to be unusual for the icy objects found in the outer Solar System. At that time, only one other detected object, Sedna, remains further than 50 AUs from the Sun throughout its entire orbit. Moreover, Sedna has a highly eccentric orbit that takes inward as close as 76 AUs before moving back beyond 900 AUs. 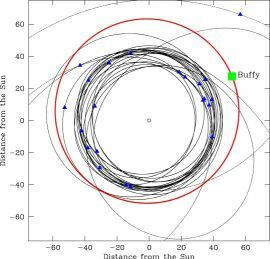 In contrast, Buffy stays in a comparative narrow orbital region between 52 and 62 AUs from the Sun. 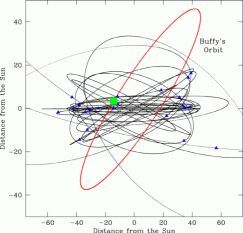 Although astronomers have detected other EKOs whose orbits lie mostly 50 AUs, these objects have very eccentric orbits, and almost all eventually move inward to within 38 AUs of the Sun, which place them within Neptune's gravitational reach and so these EKOs are generally thought to have been scattered out to their present orbits by a gravitational slingshot with Neptune to become part of the "Scattered Disk." 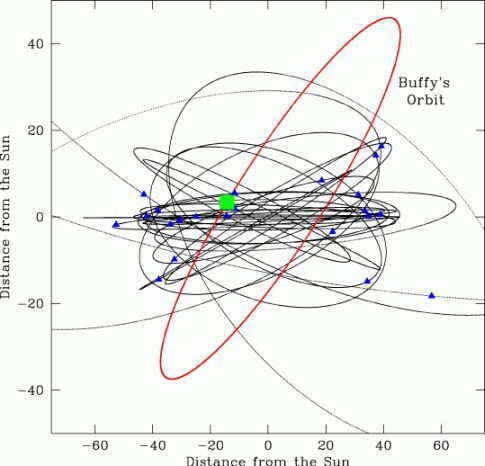 As of late 2005, only a few other EKOs were known to have orbits that stay mostly beyond 50 AUs. Unlike Scattered Disk objects, these EKOs do not move inward within Neptune's gravitational reach of Neptune but have named members of the "Extended Scattered Disk." Two of these objects (1995 TL8 and 2000 YW134) move inward to within to 40 AUs of the Sun but have fairly elliptical orbits that take them back out beyond 60 AUs. © 2005-2008 Sol Company. All Rights Reserved.